The rapidly increasing focus toward reducing road accidents and improving occupant & pedestrian safety will extensively drive AEB market growth in the coming years. An advanced safety feature that uses a combination of forward-looking sensors, automatic braking system, and driver alerts, AEB warns drivers about impending collisions. The system effectively improves driving confidence as it allows drivers to gain control over the vehicle by reducing speed or in some cases, offers time to steer off to avoid crash. The rising number of road accidents mainly in developed countries with fast highway lanes is a major factor that will boost the product’s adoption. According to the U.S. Department of Transportation’s National Highway Traffic Safety Administration (NHTSA), in 2017, around 37,133 people lost their lives in a motor vehicle collision. This can significantly be reduced by using AEB equipped vehicles. Radar-based AEB systems have gained massive traction in the recent years. The system offers features like adaptive cruise control, automatic braking and lane assistance, and is increasingly getting common in mass car markets like Europe. The system also offers improved safety than traditional features such as seat belts and airbags by actively preventing collisions. The product is capable of detecting moving objects in the path and can efficiently predict its speed and direction to maintain a safe distance, eventually offering a complete hands-off experience. With growing adoption, industry players are continuously investing in R&D to further enhance the product’s performance. For instance, in 2017, Bosch introduced its new, advanced AEB system called iBooster which was capable of detecting pedestrian and cyclists using advanced video and radar sensors. The DBS technology actively improves braking capacity mainly when a driver fails to put adequate force on the brake pedal. By electronically monitoring the driver’s brake applying speed and pressure, the system recognizes an emergency braking scenario and takes adequate measures. The increasing adoption of these systems in the event of a possible collision will augment the auto emergency braking market proliferation over the years ahead. Furthermore, the reduced effect on brakes pads and tires owing to uniform brake application will also accelerate the industry expansion. Rising commercial car sales will significantly contribute to the industry expansion as well. Nowadays automakers are mainly focusing on vehicle safety by equipping crash avoidance technology in numerous vehicles. Even electric & hybrid car makers including EV major Tesla are offering crash avoidance technology as a standardized feature in their vehicles. Indeed, auto emergency braking industry size from electric & hybrid vehicles is slated to grow at a CAGR of 20% over 2018-2024. Stringent government regulations across the globe mandating safety features such as AEB systems, airbags, ABS, electronic stability control (ESC) systems and parking sensors across vehicles will thus augment the growth of the global AEB industry. As per reports, on February 2019, around 40 countries at the United Nations, led by the European Union and Japan, agreed to introduce AEB as standard on new cars and light commercial vehicles, providing a positive outlook for the industry proliferation. Speaking of the geographical terrain, it is vital to state that Europe is likely to emerge as one of the most prominent regional grounds for the AEB industry. As a matter of fact, Europe is anticipated to account for around 50% of the auto emergency braking market share, in terms of volume, by 2024, particularly on account of the presence of prominent industry contenders such as Volkswagen, BMW, and Mercedes Benz in the region. Notable for manufacturing innovative AEB solutions, these companies have a pivotal role to play in the proliferation of the Europe auto emergency braking market. Using advanced radar and camera sensors, AEB systems effectively detect an object in the front of the vehicle. The system alerts drivers and automatically applies brakes in case of impending collisions. 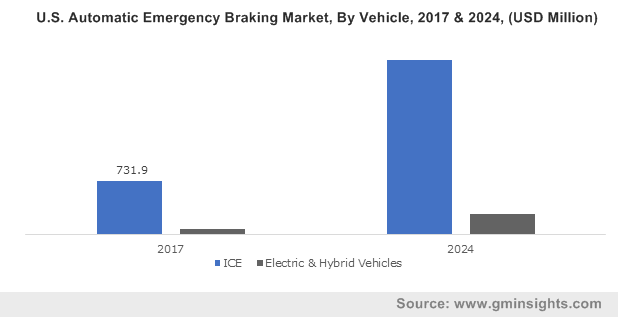 Driven by a stringent regulatory landscape that mandates the installation of safety systems in vehicles, the global auto emergency braking market is expected to evolve as one of the most remunerative spheres across the globe by 2024.